Active boost for your day. Every day of the month! 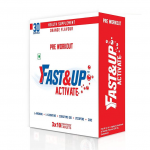 Fast&Up Activate is an intelligent choice as a pre-workout drink. The monthly pack consists of 3 tubes each containing 10 effervescent tablets. Each tablet contains some unique ingredients like L-Arginine, L-Carnitine, Coenzyme Q10, Lycopene and Zinc. The drink delays fatigue and increases endurance which is important when you need to strike a balance between lifestyle and fitness. L Arginine has distinct advantages in increasing blood flow by increasing vasodilation and enhances oxygen availability to muscle cells, thereby equipping you with extra energy to ensure you achieve your fitness goals. L Carnitine helps burn fat for fuel which is a highly critical factor when it comes to exercising, sports or a race! Just drop, dissolve and drink. How to use – It can be consumed anytime during the day by dissolving one tablet in 250mL water. Wait till the tablet dissolves and your drink is ready. Fortify with Fast&Up Fortify! RECOVER is an easy to use, best & quick post workout recovery supplements , which can be made by anyone, anywhere! With over 20 amino acids, it is the ideal drink/supplements to stimulate protein synthesis and help in repairing muscle tissues! The drink can be had immediately after your workout, race or match. While your actual meal of carbohydrates, proteins and fat will follow RECOVER is the ideal drink to have between the end of the activity and your meal! With BCAAs, L Arginine and L Glutamine (which promotes proper immune function) you don’t need to look beyond RECOVER for your quick replenishments. 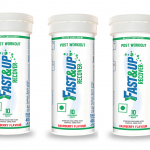 How to use – To be used after the workout by dissolving one tablet in 250 ml water. Wait till the tab dissolves and your drink is ready! Drop. Dissovle. Dominate. 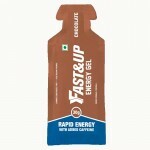 Just add water to India’s first hypotonic sports electrolyte energy drink which is low on sweetness and helps your body with the right replenishment mix of water, electrolytes, carbohydrates and vitamins! 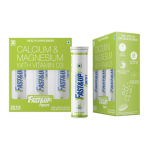 This monthly pack of 4 tubes comes in the form of an effervescent tablet which is ideal for hydrating events too. The unique combination of Sodium, Potassium, Magnesium and Chlorides helps to maintain the right electrolyte balance. Vitamin D3, Vitamin C and Calcium aids in reducing fatigue and muscle soreness. Vitamin D3 contributes towards your intake which many people in the population have inadequate amounts of. Maltodextrin and Fructose in a 2:1 ratio provide ideal combination of sustained energy and instant energy without having any sudden spurts in sugars. The effervescent mix helps in avoiding any kind of gastrointestinal distress during your workouts. 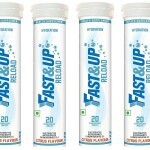 Hydrating better than water, Fast&Up Reload is trusted by some of the country’s best athletes.